Furiously strumming his jarana into the early morning hours of a stranger’s backyard birthday party in Austin, Texas, Alex Chávez was having fun with the hired musicians who had brought him along as an impromptu guest. He was also doing fieldwork. Chávez, who joined Notre Dame’s Department of Anthropology in 2014 as an assistant professor, studies “the aesthetic dimensions of contemporary lived politics”— sometimes referred to as cultural poetics. 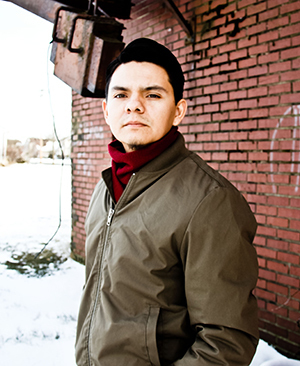 He focuses on the unfolding of this expressive grammar among Latino migrant communities in the United States. A faculty fellow in the Institute for Latino Studies, Chávez came to his research as a performer, trained in classical and jazz, but at an early age, he was also exposed to huapango arribeño, a style of Mexican folk music. While in graduate school, he stumbled upon Mexican migrant musicians who brought him into their fold. These relationships became a central focus of his ongoing work. As a teacher incorporating new media alongside tried-and-true pedagogical methods, Chávez brings this world into his classroom at Notre Dame. He has used two Teaching Beyond the Classroom Grants from the College of Arts and Letters to host guest speakers, including award-winning poet Roger Reeves, hip-hop artist Olmeca, and Colectivo Altepee, a group from Veracruz, Mexico, that gave music and dance workshops, hosted a documentary film-screening, and hosted a fandango performance—a social gathering centered around music, dance, and poetry—at the Notre Dame Center for Arts and Culture. “My efforts in the classroom are meant to reveal the heterogeneous nature of this community and its social and historical experiences with attention to migration, integration, politics, art, popular culture, and everyday practices of living,” Chávez said. Such efforts, he said, also highlight the Latino community’s complexity and diversity, which in turn reveals the diversity in the nation as a whole. “This realization is a vital step in shaping an anthropological frame of reference regarding Latinos in American society,” he said. Last semester, Chávez taught a seminar called American Borderlands, which explored the shifting boundaries of American identity and belonging along the lines of race, class, and gender. He is currently teaching the anthropology course Musical Migrations: Greater Mexico and the Circum-Caribbean, as well as the gateway Latino Studies course Introduction to Latinos in American Society. 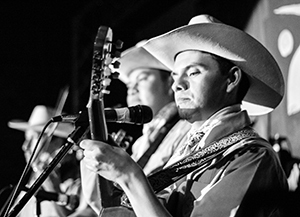 Outside the classroom, Chávez is producing a Smithsonian Folkways recording of huapango arribeño as part of the world-renowned Tradiciones music series, lending an anthropological perspective on the musical style for a broader audience. A second, more local endeavor is focused on Latino communities in Chicago.